LYNDON—A man accused of killing his wife, two teenage daughters and his wife’s grandmother in Burlingame has notified the court he intends to rely on a lack of mental state as a defense for the crimes. The written motion asserting the possible defense was considered in Osage County District Court on March 17, as attorneys for James Kraig Kahler and the state asked the court to decide which psychiatrist the state could use to conduct an evaluation of the defendant. Answering that notice, the state filed a motion for independent evaluation of Kahler, to be conducted by Dr. William Logan. In turn, Kahler’s defense team, Topeka attorneys Thomas Haney and Amanda Vogelsburg, filed an objection to the state’s designation of Logan as an expert witness, citing concern that Logan and Dr. Stephen Peterson share an office in Kansas City, Mo. 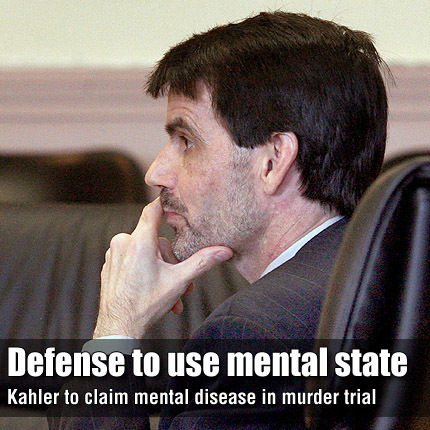 Peterson has been designated by Kahler as his expert regarding the elements of mental disease or defect. In a response to the state’s motion to use Logan as an expert witness, Haney says Peterson has been known by the state as the defendant’s potential expert and that Peterson has visited Kahler in the Osage County Jail on several occasions. In court, Haney argued that since the two doctors share office space, secretary, a library, computer system and facilities, a conflict exists that could result in sharing of information, either intentionally or unintentionally. Haney asked Fromme to disallow the state’s request to use Logan, saying it would be a minor inconvenience for the state to select another psychiatrist, while it would be a major inconvenience to the defendant to select a different doctor. “[Logan] is the only [psychiatrist] in the state of Kansas or Missouri that shouldn’t be appointed,” Haney said. Assistant attorney general Amy Hanley argued that the state had selected Logan prior to Kahler’s selection of Peterson. “We have a right to choose our own expert,” Hanley said. She said that a conflict would not exist between the two doctors because of their shared office. “There is not any information sharing going on there,” Hanley said. She said that if any conflicts exist in the doctors’ testimony at trial, the defense has a remedy through cross-examination. Fromme said if the doctors believe there would be a conflict, the attorneys should schedule a hearing for the doctors to testify on that issue. Another issue involving the doctors was the state’s request that Peterson’s report be made available to the state, to make it available to Logan before his evaluation of Kahler. Hanley argued that state statute requires the evaluation to be submitted to the court for use by the prosecution. “The state has the right to counter the defense of lack of mental state,” Hanley said. Responding to Fromme’s questions, Haney said Peterson’s evaluation of Kahler is completed but still in draft form. Fromme ordered that the report be submitted to the court no later than March 21. “We do take exception to the court’s ruling,” Haney said. The court also considered a motion by the defense to bring two witnesses from Texas, described as uncooperative by Haney. Haney said he expected the witnesses would be treated like all others, and only asked to be present in court during the time they are to testify, but he needed the court’s order to compel them to come from Texas. He said the motion would require enforcement in Texas also, but he expected a Texas judge would require travel expenses be provided to the witnesses. “We don’t intend to have them to come up for 30 days and cool their heels, as we wouldn’t want any witness to do,” Haney said. Osage County Attorney Brandon Jones said paying for expenses in advance is not a normal procedure; usually witness expenses are reimbursed afterwards. Jones said statutes did allow “out of pocket food and lodging expenses if approved by the county commissioners,” but he had not spoke with the county commissioners about the issue. “That’s something I need to address with them,” Jones said. He said the amount of per diem requested in the motion was more than that paid to county employees for travel. The judge also said he was not agreeing to the amounts listed in the motion for reimbursement of the witnesses. Fromme asked if the witnesses would need to be in court more than once. In an undisputed motion, it was agreed that two of the state’s witnesses, former employees of the Kansas Bureau of Investigation that now reside in Afghanistan, would be allowed to testify during depositions while scheduled for leave in May.